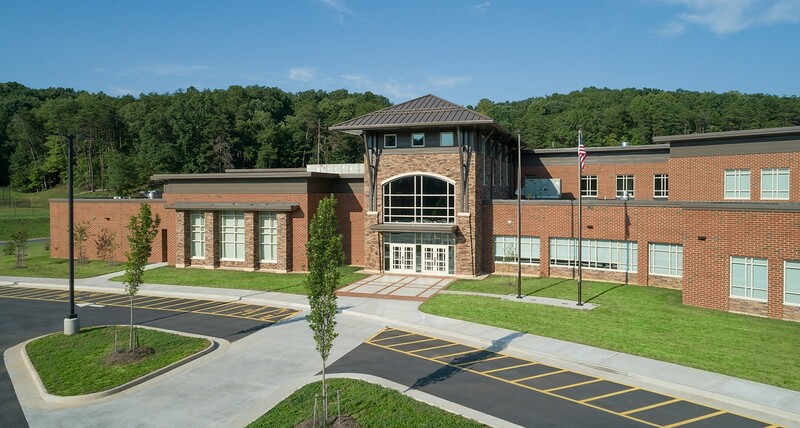 Meadow View Elementary School, located in Henry County, Virginia and designed by RRMM Architects, has been selected as the Gold Design Award winner for the Virginia School Board Association’s Exhibition of School Architecture. 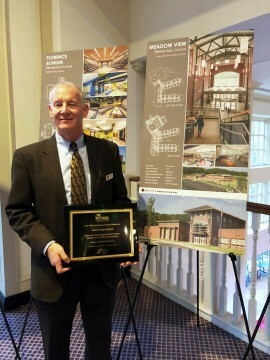 Winning projects were selected from those submitted by seven architectural firms in the areas of new construction, renovation and adaptive use of existing space. As the first new school for Henry County in over thirty years, Meadow View holds special significance for the community. In addition to wanting modern features, the community also wanted the new school to have a design character with a civic presence they could be proud of and consider uniquely Henry County. To achieve this, RRMM worked closely with Henry County Public Schools staff to select a suitable site. The chosen site features a picturesque, wooded pastoral siting that allowed the new building to be displayed proudly along a well-traveled road. The new 600-student, Pre-K through 5th-grade facility includes a multi-purpose gymnasium and cafeteria combination space that features a large, operable wall between the two spaces. This allows for separate and distinct functions, but with the opportunity to open the space to seat large crowds facing a singular stage when needed. The spacious, two-story lobby is centrally located and adjacent to the reception area and administrative offices to allow for easy supervision. Each classroom wing has been positioned for ideal solar orientation to achieve well-controlled natural daylighting. Carefully engineered window openings and diffuse glass are coupled with automatic lighting controls to create aesthetic classroom spaces and conserve energy. Each grade wing contains a resource room that promotes collaboration and provides smaller breakout spaces for specialized instruction. The RRMM design team for Meadow View Elementary School included Ben Motley, Michael Mauceri, David Jones and Nick Duncan.